White House Changes Tune For Wall Street? 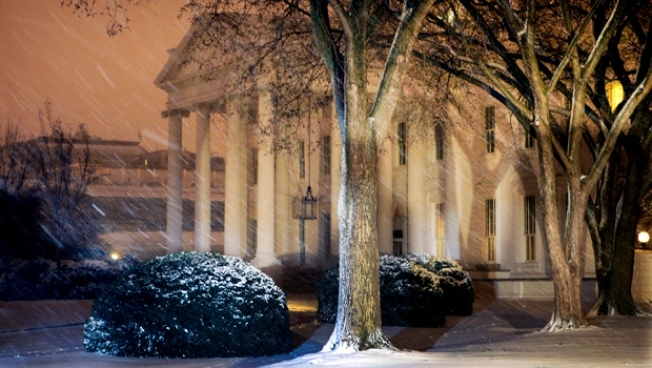 Snow blows in on the White House grounds in the early morning hours, Monday, March 2, 2009, as a snow storm moves up the East Coast. The Obama administration’s hope-and-change show hasn’t played well on Wall Street, but in the last week investors may finally be getting some of what they want and that could bring a happier ending than anyone imagined. In its opening weeks the administration’s controversial cocktail of crisis management and social reform has made investors despondent, not hopeful, and change for the stock market has usually meant another price decline. "It’s turned into a malaise," says veteran money manager Jim Awad, managing director of Zephyr Management. “Everything is going wrong. Nothing is going right." That is, at least until Tuesday. There is now bipartisan Congressional support for reapplying the uptick rule for short sellers of stocks, which will presumably reduce negative momentum during market declines. More importantly, Congress is now pressuring regulators to adjust, if not totally suspend, the controversial mark-to-market accounting rule, which may help the market deal with the pricing of toxic assets now held on the books of big, troubled financial institutions like AIG (NYSE: AIG) and Citgroup (NYSE: c). Some change seems inevitable in the near future. "One of our major jobs is to give investors confidence," House Financial Services Chairman Barney Frank (D-Mass) told regulators during a public hearing Thursday on the mark to market rule. Investors have responded with stocks surging Tuesday and Thursday. Before the surprising—and some say suspect—rally, however, the S&P 500 was down 28 percent this year to 676 and trading at a 13-year low. On Election Day in November, the benchmark average closed at 1005, after a 4-percent surge. As welcome as recent events may be, critics in New York and Washington say the White House still has a lot to prove. Rep. Michele Bachmann (R-Minn.) says the President’s recent comment comparing the stock market’s daily gyrations to "a tracking poll in politics" shows "a sense of naiveté," adding it is "very concerning that this is the number one issue of our time and he is comparing it to polls." The President’s apparent lack of appreciation, or even empathy, for the plight of investors losing their retirement savings may be matched by their disenchantment with his policy initiatives. In short order, the Obama administration has cranked out a massive stimulus plan, a financial stability plan, a housing plan, a health care initiative and a budget blueprint. Trillions of dollars later, the measures—individually or collectively—have not only failed to reassure or impress Wall Street, but have actually spooked it. Proposals like that essentially add insult to injury, and have become part of the problem, say critics in economic, market and political circles. Another part of the negative dynamic is that Wall Street now has to contend with its traditional worst enemy—uncertainty—as well as unfriendly initiatives to investors, business and taxpayers. "Obama is far more concerned about political considerations than economic ones," says crisis management consultant Eric Dezenhall, who worked in the Reagan White House. "Obama has a tremendous amount of moral authority that translates into business hardship not being something that hurts him politically at this point." Business support to the President’s various initiatives, however, has been lukewarm in most cases and cool in some others, even though there is prevailing agreement that the country needs to stand behind the new President. Yet, that’s becoming difficult for some amid all the market’s declines with Wall Street looking increasingly unimpressed with both the administrations policies and communications. The stimulus plan and other economic recovery initiatives are now totally suspect in some circles because they appear to be driven more by a social, not economic, agenda and political, not practical, considerations. "Think of this as redistribution; it is not stimulus," says economist Robert Brusca of Fact & Opinion Economics. "In some sense it is all about income." Critics argue the spending initiatives are not only ill-conceived but are potentially inflationary for the economy and also aggravate an already swollen national debt, circumstances that have rarely been good for Wall Street. "I think people like the President but they don't like his policies," says Tom Schatz, president of Citizens Against Government Waste. (The latest NBC/Wall Street Journal poll shows that to some extent.) "There are tipping points at which time enough people will look at this and say, 'We can't let the government do more and make it worse.'" If the shortcomings of the stimulus plan weren’t enough, there are those of the programs more near and dear to Wall Street, such as the financial stability plan, which when unveiled a month ago by Treasury Secretary Timothy Geithner lacked key details. "Conceptual plans without meat, “says Awad, describing Wall Street’s under-whelmed reaction. “You need to have a plan on the banks and the bad assets. You cannot have confidence without it." "Geithner needs a plan,” says Sen. Bob Corker (R-Tenn.), echoing a growing impatience about the administration’s delay in advancing its plan for a public private partnership to deal with the pricing of toxic assets. Though that may go a long way to boosting Wall Street confidence, such a plan is probably still weeks away—along with the results of the high-profile stress tests being applied to the top 20 institutions. "A lot of the horrible economic pain has been concentrated on Wall Street," says Richard Wolff of the University of Massachusetts. "What you see on Wall Street is perfectly understandable; The frustration as people look at the problems that keep getting worse and what the government—whether it is Bush or Obama—is doing. It doesn’t look adequate. It looks like things are out of control."